[Kroft] Did you seriously consider sending the girls to public school? You know, we’re still in the process of figuring out that transition and what we have asked people to understand is that the decision that we make will be based on the best interests of the girls. We haven’t made that decision yet. We want that to be a personal process, and people have been really good about respecting that. I do respect the Obama’s decision as parents to choose the best school for their girls, but most parents in the United States do not have this luxury. I am a public school teacher, and I strongly support public education as a necessity in a democracy. It is a personal decision of the Obama family where their children attend school, but politically, public school would be the best decision. It sends a message that Obama believes in public education: Politician after politician states that they support public education, but when it comes to their own children, public schools are not good enough. This hypocritical message tarnishes public opinion of our school system, and it furthers the view of politicians as elitist. Sasha and Malia currently attend private school in Chicago. Public school curriculum will reflect Obama’s environmental mandate: Republicans, such as Arnold Schwarzenegger, have vetoed climate change as part of the science curriculum. If our president, who believes and wants to act quickly on climate change, sends his children to public school, scientific-based environmental education will become part of the curriculum. If I were Sasha and Malia’s teacher, I would certainly follow their father’s lead on global warming issues. Sasha and Malia will be safe: The most common reason I have heard in favor of private education for the Obama girls is their safety. For some reason, there is a public perception that private schools are safer than public schools. Sure the Obama girls require extra protection as members of the first family, but private schools are not immune to school shootings. If you can’t keep Sasha and Malia safe at public school, then my kids aren’t safe there either. Private does not mean less public in terms of media attention: Bill Clinton chose to send Chelsea to private school in order to protect her privacy. Just because the word “public” is in public school does not mean that confidentiality isn’t taken seriously. Public schools are not going to release Sasha and Malia’s grades to the media, and the same steps that would be used at private school to ward off the paparazzi can be used at a public school too. Public school will help make the Obama girls life more normal: Obama stated he can’t go to the barber shop anymore; his barber meets him in an undisclosed location for a haircut. Life for the First Family is far from normal, but attending public school would give Sasha and Malia a chance to be friends with normal, average, regular children. Sure, they may be treated a little differently with Secret Service agents following them around, but at least they won’t be attending school with children only from elitist families that can afford tuition of $28,000 a year or more. Sasha and Malia will get a good education: When I worry about my children’s education, a former teacher and friend reminds me that family is the most important factor in a child’s education. Sasha and Malia could attend the worst school in America, and I believe they would still get a good education. Involved parents meet with teachers, participate in school committees, help their children with homework, enrich their children’s education, etc. Michelle Obama has stated she wants to improve the public school system in DC: What better way to improve a school system then to get involved in your own children’s education? I guarantee that whatever public school the Obamas choose, that school will rise to the occassion. Children that attend public schools in their communities have stronger ties to that community, and thus their families are more invested and work harder to improve the community too. Perhaps it is not appropriate for us to debate this personal choice of the Obama family, but I believe it is a very important decision for public education. As a school teacher, I will feel disappointed if Sasha and Malia go to private school, but as a mother, I understand the need for families to make the best choice for their children. You only get one chance at childhood in this lifetime. This decision is not only a very personal one, but in this particular case, one that not many in this country can begin to understand. This is America’s first black First Family, and as un-PC as that may sound, it’s the truth. These girls face safety issues that the normal student does not, so it’s unfair to say that if it’s safe enough for me kids, it’s safe enough for the First Kids. It’s naive to think that we know how safe these girls will be on a public or private campus. I’m not knocking the public school system at all. I am a product of public schools, and I was fortunate to have awesome teachers that actually paid attention and pushed me onto a path that would not have been revealed to me otherwise. But I’m not the President(-Elect) or the First Lady, so I can’t really form an informed opinion about where the Obama girls should go to school because they have so many factors to include in their decision that don’t apply to me or my family. I agree with you. My wife has been a 4th grade teacher in public schools for some time. The kids get a great education when they are under the tutelage of a teacher who is passionate about what they do and enjoy their work. Don’t forget, you can get bad teachers and education in private schools also!! Mocha Mama, I agree safety is a concern, but they will be a target no matter where they go. I didn’t include this in the post, but on my way to work I thought that if was the Obama family, I would seriously consider home school. That is one option I have not heard discussed. Not sure what that would do politically, but it would be the safest option. My husband and I had this exact discussion after watching the 60 minutes interview last night. To me, the look on Michele Obama’s face said that she would do anything to put her kids in public school if they could be safe. My husband laughed and said, no way–too much security would be required. We both figured they would home school the kids. Then my husband said maybe the Obamas would bring a classroom to the White House. That would make sleepovers easier. I would certainly disagree with the suggestion that you can’t have “normal” and “regular” children in private schools. But perhaps not average. I went to school with some of the most brilliant, motivated, creative, and inspiring peers. I was fortunate to go to one of the best schools in the country for high school. It was a private school, and I’m not in any way ashamed, in fact, I’m proud and honored. I learned from passionate intellectuals, and was consistently challenged. The main difference I see between going to my school, and the public high school is the network that I get for life. Graduates have a strong commitment to give back to the school, and make it possible for other students to get the same (and even better) opportunities. I have given back to my school fiscally, with my time, and with my love, and so have the majority of my peers. The idea that students must be of a certain socio-economic level, race, or ethnicity is also untrue. For families with incomes under 75,000 a year, my high school provides a completely free education. This is mainly possible because graduates are deeply tied to the place. For many of them, it was the best times of their life. What I particularly love about my high school was the opportunity to cultivate friendships with people from all over the world, and more important were different than me. Had I stayed at the local high school, I would have been in a sea of white, where there is less than 5 percent minority, and a complete lack of religious diversity. Further more, I would not have gotten the experiences I had, including the ability to develop and implement a sustainability plan with the school, learning critical skills that I have developed into my every day work. I understand the need for good public schools. Many of my friends and family teach in the public education system, and I myself have worked in my own town to give back to the community through the process of creating and energy plan and working with teachers on environmental curriculum. Many of my friends who teach science in public schools are making their curriculum based on what they learned from our high school. I hate to see Malia and Sasha being used as political pawns in this case. We certainly need to improve the system, and maybe this means for the kids to be in the public school system to kick start desperately needed action. Each child is different though. Again, I don’t mean this to be a rant. And I certainly respect your work as a teacher! You are an incredibly well spoken person, and I would love you to teach my kids! Sam, thank you for disagreeing so eloquently! I think that my statement was misleading. I did not truly mean to imply that children at private school are not normal. I guess it all depends on the private or public school. Truth be told, I attended a rather elitist public school, because it was in a rich neighborhood. My parents were teachers, and we could not keep up our friend’s new BMWs or Gucci purses. Other schools called my high school the “university”, because we had two gyms, indoor pool, etc. Every school is different; every kid is different. I agree Malia and Sasha should not be political pawns, and I almost didn’t write this piece because of it. I have bought into the Obama dream of change, and I think it would be great if the kids were placed in public school. I’ve been thinking about it since I saw 60 Minutes, so I had to share my thoughts. I feel strongly that children are not and should not become a political vehicle. The Obama family should make whatever decision they feel is the best one for their children. The girls are not in political office, nor do they get to choose this life. Basing the girls educational future on politics would be to do them a grave disservice. 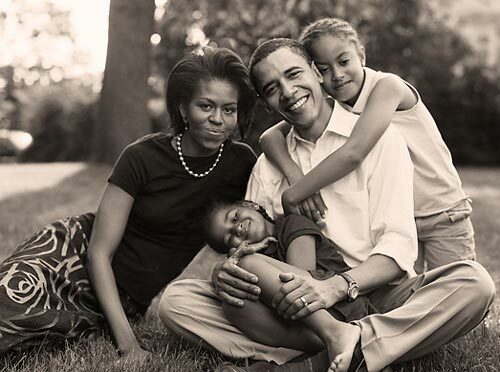 Family is ALWAYS first and I will be impressed if the Obama Family puts their girls needs before their political agenda. Jennifer, while I understand your viewpoint on many of the other things you mentioned in your post, I’m going to have to disagree with you on the above point. I have friends whose children are very bright who have enrolled in public school only to be told their child has some “disorder”. The parents are devastated to learn that their child now has a label and the child starts his or her formal schooling with the idea that there is something abnormal about them. My very curious, strong-willed son, who excelled atypically at certain things as a preschooler would have been miserable being forced to conform to the teaching methods at school. He has no problem making friends, getting along with adults, people in positions of authority, etc. He just has ideas and expressions about the world and what he learns that don’t fit into the mainstream public school curriculum. I think if one is to think progressively about education, it would be clear that if people are entitled to choose who they marry, what happens to their bodies, etc., then, parents should be entitled to choose the education that best suits their particular child be it public or private. There are many things wrong with public school and private school today and many things wrong with rigid homeschooling, but there are also right things about all of those educational methods and the best parts should be given attention. The Kennedy’s did just this with Caroline’s kindergarten. First, let me say that I always enjoy reading this site, but I find myself disagreeing strenuously. Parents, regardless of who they are, have an obligation to do what is right for their children and that that obligation rises above all other possible considerations. So, when your #1 reason is “It sends a message that Obama believes in public education”, I frankly find that a bit offensive. Children are not born to shoulder the burdens of their parents, or to be the tiny messengers for their parent’s (or anyone else’s) political ideas. They are human beings and deserve more consideration than that. I am a product of public schools and have great respect for the public system. Still I take issue with the idea that a parent, *any* parent, should give their child to a system that may not be ideal because it looks good. Mama Bunny, thanks for sharing your thoughts. My reasons were not intended to be prioritized by the numbers. I guess I should have made that clear. I have learned a lot from our readers comments, and I find myself seeing many sides to this issue and agreeing with many people that disagree with me. It is the reason I decided to write this post, so the conversation could occur. I guess I believe that should the Obamas think public school is the best option because of their beliefs in the system, then I am sure there is a perfectly good public school that would fit their children’s needs. I have a friend whose granddaughter is four-years-old and reading. She is concerned about her experience in public school kindergarten. Another friend, former librarian at a private school, told her they should send the child to private school. My friend is a former public school teacher and her daughter agrees…public school is where the child belongs. Money isn’t the issue, but belief in the public school system. They are meeting with teachers and principals this year to find the best public school for the child. This is what I have read the Obamas are doing on all fronts. They are looking at both private and public schools in DC. I don’t think that Sasha or Malia would suffer from a public school education or that this is a burden. Do you think that children from families that can’t afford private school are carrying the burden of their parents? We raise our children with our values, so in many ways, they are tiny messengers. My children are eco-conscious, vegetarian, and environmentalists. They are encouraged to make their own choices, but I have shared my values with them. They reject plastic toys and processed foods. They are not coerced, but they are given information and reasoning to develop their own values, that yes, reflect their parents of human, animal, and environmental rights. Does this make them tiny messengers? This is my first read at your site. I am African American and spend as much time trying to positively impact my community as anyone who doesn’t do it for a living. I’ve probably averaged 60 hours a week for two decades in purely voluntary service. I am not wealthy and barely comfortable; yes, i have lots of debt. Lot’s of African Ameicans think everyone should remain in the inter city and send their kids to inter city schools…because, if the middle class didn’t dissert the poor then the schools would be better. But let’s get real. Does anyone have a right to compromise their children’s future because the world isn’t the way we want it to be? Doesn’t everyone have a responsibility to provide the very best for their chldren that they possibly can? I think so. So that meant that my children went to very diverse private schools! And I am not president of the United States and African American, so I don’t have to worry about making my child an easy target for every ollny racist in America. It will be far easier to protest the welfare of these to precious human beings whose father and mother just happen to be president/first lady in a private school with acreage and they will receive a better education than most public schools. Half the kids in America’s very best colleges and universities come out of public schools. They are either extraordinary kids with empowered parant(s) or the public school was actually on par with most private schools (read that as they were part of an honors program of an excellent school; and read that as just as good as any private school). In St. Louis that means Metro High School, an “honors school that you must test into and know someone although they claim that you need not.” But it’s not in a setting that would allow what I consider adequate security. To make it adequate would make it more of what it already is……A PRIVATE SCHOOL FOR EMPOWERED PARENTS WHO WANT TO CLAIM THAT THEIR CHILDREN GO TO PUBLIC SCHOOL “IN THE CITY” WHO AVOID TUITION AND KNOW DAMN WELL THAT IT’S THE BEST HIGH SCHOOL IN THE STATE. So I ask again…Does anyone have the right to compromise their children’s education. I believe the Obama’s told the truth. They are trying very hard to find a setting that will allow unthinking Americans to respect their decision and not compromise their children’s education and physical or EMOTIONAL wellbeing. Personally, I will respect their decision AND PRAY FOR THEIR CHILDRENS’ WELL BEING. After all we live in a cruel and dangerous world and those children are their immortality. Howard, thank you for your comments. You make a good point about elitist public schools. We have seen that happen with charter schools, where there are lotteries to get in and waiting lists. The schools get the cream of the crop, and many fail to select special needs kids because they don’t want to pay for the services they require. The issues of schools, whether public or private, is complex. I tried to show my respect for the Obamas decision in the post, as well as voice my opinion as a public school teacher. Of course, my opinion doesn’t really matter, but I don’t think that Sasha and Malia’s education would not be compromised by public education….but that is not my choice and really impossible for me to decide, since I don’t know the girls personally or what it is like to be in the First Family. I think that Michelle Obama is right- it should be about what is right for the kids not how it reflects on their father. These girls have gone to a prestigious private school all of their lives. They are used to mingling with children of diverse racial and ethnic backgrounds, but with a similar lifestyle. I vote for the Georgetown Day School which is diverse, progressive and private….similar to the Chicago Lab School from which they come. If they had gone to public school in Chicago, which they could have done. that would be a different story. But in an urban setting, public school is different than it is in a suburban or rural setting and obviously the Obama’s considered that before eschewing the Hyde Park public schools in favor of the U of Chicago Lab School. MC, You raise some very good points about the kids’ past experiences. My public school experiences as a student and teacher are in suburban and rural settings. I think this comes down to the good for the individual versus the good for society as a whole. Should the Obama girls go to public school because it shows support for the public school system, even if it won’t be the best education for them? Brenna, I think you simplified the argument well…but I still think that there is this assumption that public school would not be the best education for the girls. Why is there that assumption? Is public opinion of public schools that low? As a teacher in a public school I can’t help but imagine the extra responsibilites the schools would be faced with. I believe that already overstressed inner city schools should not have the additional responsibility that comes with hosting the country’s most famous children. Their specialization is not in public relations nor dealing with the special service and defending the privacy of not only the girls but whichever children befriend them from the prying media. Certainly, many schools would be up to the task if needed, but my point is that it shouldn’t be asked of a school that is already struggling, as the public school system in DC certainly is. Many of those DC private schools are built around these logistical and legal issues for politician’s children. Their smaller population and established policies were designed for the safety of girls like the Obama children. I think it’s unfair of people to say the choice of private school is elitist. They need to consider the fact that other options are closed off to the girls without a great deal of effort on the part of people who might be better off serving children with higher needs. In other words, there is a way, but is it the best thing for all involved? I am sure the girls can be happy in any classroom full of professional and motivated teachers. But outside those four walls, it gets a lot tricker. This is a very thought-provoking post. I read it a few days ago, and have been thinking about it. I think you do make an interesting case on the pro’s of public school, and do a nice job of debunking some of the myths about public school. I am really hesitant to send my boys to public school, mainly because I think there are too many problems in the public schools that are beyond the school and teacher’s control, which will end up affecting the quality of education my sons receive. How can the teacher work with my sons’, if there are kids below grade level in the class that she/he needs to bring up to speed? Too often, the kids that are at grade level, or are doing “ok” do not have the attention of the teacher- they have to spend their time with the kids that are below level, or the kids that have issues. Throw in overcrowding, and it does not seem like it is a great formula for success. But, I think you have to take into account the school- every school is different. I have heard the public schools in D.C. are the worst in the nation , but on the other hand, there has to be good public schools in D.C. as well. We are moving to a town that is in our same school district, but the schools there are much better than where we currently are. We are going to try public school and see how it works out. I will not hesitate though, to pull my kids out, if their needs are not being met. I think every parent has that right-the Obamas included. In the end, parents have a responsibility to their children, to make sure they receive a quality education. It would have been nice to see the Obamas give public school a try, but it is their decision to make. Amy Carter is the last “first child” to attend public school- however the Bush twins, Jenna and Barbara did attend a public university- U. of Texas, but they were already enrolled there, when Bush took office. I can’t fault the Obamas for choosing what they feel is the best school for their daughters to attend- it isn’t really a surprise they picked a private school- the girls were in a private school as well in Chicago. The only thing I will have a problem with, is if the Obama administration takes the choice away from parents. He has said he is against vouchers, and that makes me a bit cynical. It is ok for his family to have the choice, but no one else? We’ll have to wait and see. Except that these days parents realistically have minimal impact on how government-run schools are run. The real decision-making power is shared between the powerful teachers’ unions and bureaucrats hundreds of miles away in the state capitol or thousands of miles away in D.C.
I’d love to have the option of a co-op school where parents truly do have a significant impact on the way their children are educated. Unfortunately, there isn’t one available to us so I’ve decided the best way to ensure my children receive the kind of education I want for them is homeschooling. As a parent i hope one day before my child become a teenager i can home school. I wouldn’t advise anyone to public school there children. We see every day on the news the weirdest situation concerning public schools. Are you nuts? i have lived in DC for several years and very well aware of the public school system. you are correct that Sasha and Malia would be exposed to every socioeconomic group and a wider group of children; however, that is not always good. These two children will be exposed to experiences the average child will never experience or understand. Exposure to a wider group may not be in the children’s best interest. Sidwell understands security and the needs of high profile children. The public school system with overcrowding in the clasrooms, mainstreaming of emotionally disturbed kids, I truly beg to differ. It is unfortunate that public schools are in the mess they are in today and I understand that there are some good educations to be had in the public school, but the DC public school system is not the place for these two. Well, it’s not as if we are a nation that truly cares about our children folks. After founding http://www.FamilyLawCourts.com in 2001, I have truly come to understand how much of a marketing tool they are. Have seen far too many cases of the apathy of neighbors who don’t want to get involved, and whom allow this to continue, to have any hope for public schools. See the “Kids Killed” section. Ask yourself how many children of divorced parents do you step up for?